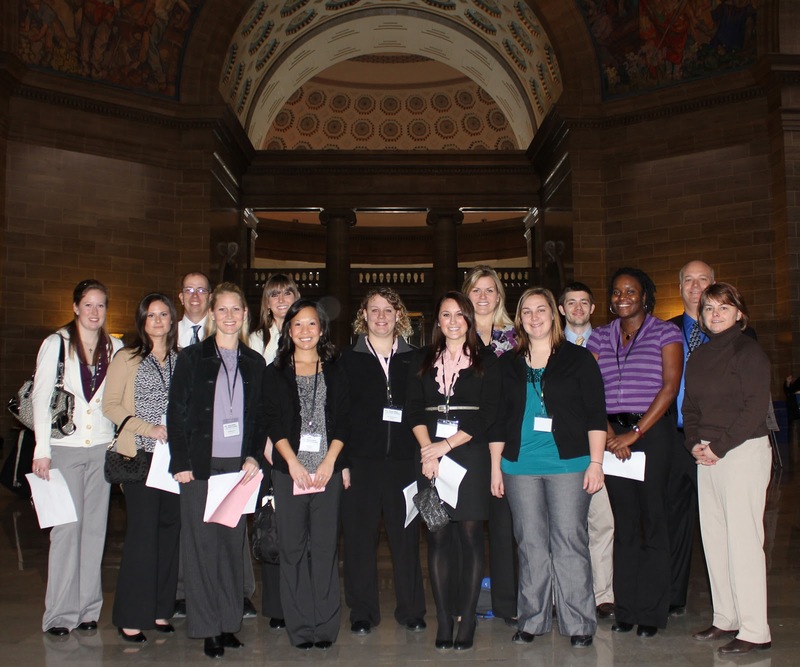 SLU Athletic Training Students and Faculty members had the opportunity to participate in the Missouri Athletic Trainers' Association (MoATA) Day at the State Capitol in Jefferson City on Tuesday, February 8th. Pictured in the Capitol rotunda (from left) Laura Gosewisch, Mollie Cole, Tim Howell, Lori Khazen, Diane Schlesselman, Leah Egeland, Ann Schmerbauch, Emily Monahan, Meghan Gehrs, Kacey Morrison, JJ Hannigan, Kemba Noel-London, Tony Breitbach, Kitty Newsham. - Development of a poster on one of the five new domains of athletic training. - Meetings with state senators and representatives. - Hearing the introduction of an athletic training bill on the floor of the Senate. - Networking with students and athletic trainers from all over the state. - Ice cream social with legislators.